Recovery is a vital part of training. Arguably, it is even more important than the training itself because adaptation to training is the precise reason we do it to begin with. It’s during the recovery from and adaptation to a workout that the body becomes bigger, faster, and stronger. So in order to make the most from your training it is important to have some awesome recovery strategies in place as a part of your training regime. I’ve put together a list of my top 5 favorite ways to help you maximize recovery and improve performance long-term. Use a sleep mask. Sleep is perhaps the most important ways your body recovers from daily use with experts recommending 6.5 to 8.5 hours of sleep a night. Light is detrimental to sleep quality so making your bedroom pitch black at night is ideal. However, that can be difficult in our digital age where everything has a light on it so a good alternative is using a sleep mask. Eat pre and post workout. As the old saying goes “you can’t out train a bad diet.” To get the most out of your training it’s important to fuel your workout by eating something with protein and carbohydrates before you train, maybe an hour to 90 mins, and to eat something immediately after with protein and carbs. Some people can’t eat a meal immediately after a workout so a protein shake or some chocolate milk can be a good substitute. Eating pre and post workout will make sure you have the fuel to get through a tough workout with plenty of energy and will provide you with the amino acids needed to repair the muscles torn down during the intense session. There are a host of other benefits to go along with these but that will be for another post. Get a massage. A skilled massage therapist can find tight muscles you didn’t realize you had and get blood flow to the areas that need blood (remember, blood = life and healing). If you are unable to find the time to get a massage regularly or don’t have the funds for it, foam rolling can give you some of the same benefits and can be easily implemented on a daily basis. Take a hot soak. A hot soak can help relax you and bring some extra blood flow to beat up muscles and joints. My favorite soak is an Epsom salt soak using two cups of the salt in a hot tub and submerge as much of myself under the water as I can for about half an hour. The magnesium from the Epsom will help you relax especially well and help speed up the recovery process. I would recommend not doing an intense workout the day after an Epsom soak because I’ve noticed that I’m still kind of relaxed that next day and don’t usually have a great workout. Play around with the timing a little to find out what works best for you and your schedule. Use the down time in the evening to work on mobility or correctives. The evening time when you are starting to wind down or watching a little TV can still be productive by running through a sequence of stretches or to do a quick corrective exercise or two. Stretching in the evening can be really productive because it allows you to spend a little more time in each stretch and it’s a far more relaxed atmosphere than the gym. Start to implement one or more of these techniques into your daily or weekly routine and see how well they work to help keep you healthy. Some of these can be done on a daily basis, like evening mobility, and some on a weekly or monthly basis, like hot soaks or massage, but as each of us are individuals you will need to play around with these on your own in order to find out which is the most beneficial and practical approach for you. Ben graduated from Texas A&M University in 2014 where he earned a Master's degree in Kinesiolgy. While at Texas A&M he worked as a volunteer Strength and Conditioning Coach in the athletics department and Coached the Texas A&M Powerlifting team. 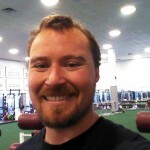 Ben is an active strength athlete competing in powerlifting and strongman and is a committed lifelong student of how to improve human performance.